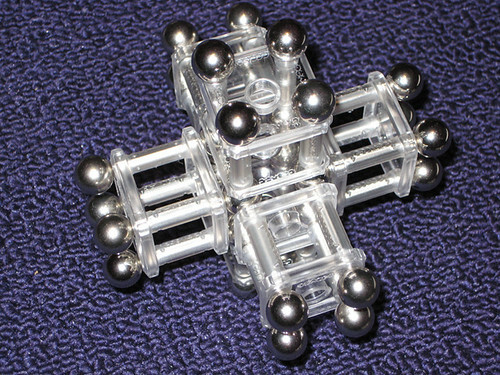 Geomag Forum • View topic - Marking north. Why panel holes for? Wire-frame base? Finally, a base. Some constructions like the Eiffel Tower or Tokyo Tower have "splayed" legs. Are there any common strategies to prevent the legs from sliding outward from under the overlying weight? I've seen one Eiffel Tower with a ring of geomags around the feet, but this still looked tenuous. I've wondered about a board with holes drilled into the board (like a pegboard, but with many more holes.) But it is hard to imagine what pattern and how many holes to drill. Also the spacing would have to be very precise. An alternative would be some kind of strap assembly to wrap around the bottom feet. Imagine the aluminum chains some necklaces are made from but with a sling at the end to wrap around a sphere and a screw assembly in the center to adjust the tension. Has anyone tried anything like this? Re: Marking north. Why panel holes for? Wire-frame base? This is an example of a construction that makes use of the holes in the panels. We call it Floater. The holes in the panels hold the repelling magnets in place to allow the upper portion to float. We can't take credit for creating it but we built this one. ...And, yes this would have been easier to build had we marked the poles on the rods but I don't think we could bring ourselves to marking our rods. I marked all my bars for my daughter's benefit in helping her build her own models. What I did was use a black sharpie marker and color the exposed magnet on the north end of each bar. That way the bars themselves did not appear to be defaced with any markings upon casual inspection from the side, but a quick glance at one end would identify which end you were looking at. I have a picture of my work in another thread...I'll find it. the letters and numbers stamped into the ends of the bars. where polarity really matters, I use a ball to test a joint for imbalance. is a transparent cover that allows you to make stylized panels - cute marketing fluff.